This Sunday, June 16th, is Bloomsday, the annual celebration of the events of James Joyce’s Ulysses, which is set on June 16, 1904. Since its inception in Dublin on the 50th anniversary of Leopold Bloom’s fictional peregrinations, Bloomsday has followed the germinating spores of the Irish diaspora and become a worldwide phenomenon. While events in Dublin and New York tend to be the largest and best-known, you can likely find some kind of Bloomsday event wherever you are. Below is a sampling of the day’s global festivities. This year, by far the most ambitious event is one you can take part in no matter where you are, as long as you have an internet connection. It’s called the Global Bloomsday Gathering, and beginning June 15th at 9:00pm GMT, readers in Auckland, New Zealand (8am, June 16th local time) will kick off a marathon reading of Ulysses. An hour or so later, readers in Melbourne Australia will pick up the torch, then Sydney, then Canberra, Australia’s capital, then 21 other cities as the earth continues to rotate into the morning of June 16th. Spanning nearly every time zone, four continents, and at least 30 hours (the scheduled end is 3:30am Monday, June 17th GMT), the entire reading will be live broadcast online at globalbloomsday.com. Participating cities are traditional Irish strongholds like Boston, Chicago, and New York, but also places like Tokyo, Sao Paulo, Beijing, Moscow, and Trieste, where much of the manuscript was written. Unfortunately, even if you are in one of the cities where they are happening, most of the readings won’t be accessible to the public to attend other than on the web; but several cities have events ranging from the reading of a single episode to costume contests. 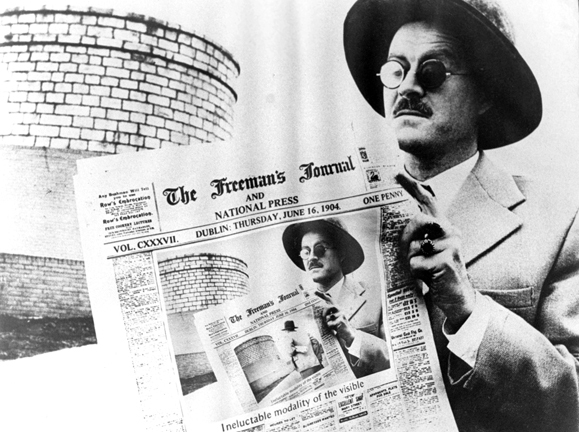 Dublin commands the most notorious Bloomsday program, which rambles in the footsteps of Bloom himself through the city. The James Joyce Centre has a full calendar here, but the halmark of the 16th is the Bloomsday Breakfast (“icky inner organs and all!” according to the website), which will feature Actors Les Doherty, Elaine Reddy and John O’Donoghue performing scenes through the meal, as well as songs from the book performed by Sinead Murphy and Darina Gallagher (Songs of Joyce). Here in New York, the best-known event is easily the Symphony Space’s Bloomsday on Broadway, where avid Joyceans, professional writers, actors, and scholars come together to read from Ulysses at the Peter Jay Sharp Theater. This year, Irish actress (and Irish America Hall of Famer) Fionnula Flanagan will be performing the Molly Bloom soliloquy in whole, and the readings will be interspersed with traditional Irish music performed by Lisa Flanagan, Adam Harvey, Kevin Rockower and the Rogue Diplomats. The other famed event in New York is held at Ulysses bar in lower Manhattan. Over the course of this coming Saturday and Sunday, four chapters will be read aloud at the bar, each featuring a different special from the menu (I’ve got my eye on you, free half glass of burgundy and plate of gorgonzola brunch offer). At 2pm, Irish writer Colum McCann will host a host of literary folks reading extracts from the novel, and by 5pm, drinks are on the house (at least until 7, and as long as they’re under $10) in celebration of the Cyclops episode. The Irish Repertory Theatre is honoring Ulysses for the whole month of June with a new adaptation of the novel called Gibraltar. The play, starring Patrick Fitzgerald and Cara Seymour as Leopold and Molly Bloom respectively, is on stage until June 30th. Elsewhere in the country, there’s much, much more. On Martha’s Vineyard 20 performers, actors, dancers, and musicians will gather at the Katherine Cornell Theater for the 35th annual Bloomsday Celebration. In Philadephia, the Rosenbach Museum, which features in its James Joyce collection the signed manuscript of the Circe episode, will host an all-day reading of Ulysses. There is a symposium in the park in Baton Rouge with LSU professor and Joyce scholar Patrick McGee and in New Orleans, a reading is scheduled at The Irish House pub for 2-4pm with some famous local authors, but mostly including anyone who wants to read. (The 4pm end-time may be a bit of a tease, since last year the New Orleans reading lasted over 12 hours because people kept showing up to read.) In Seattle, The Wild Geese Players will perform (for the 16th year in a row) one episode from novel. This year, they will be performing the Penelope episode at the Elliott Bay Book Company. There are so many events around the country that no list can even attempt at comprehensiveness, but the Rosenbach Museum’s Bloomsday Central gives it a good shot right here. Staged readings, Edwardian garb, dramatic performances, and musical renditions from Santa Maria, Brazil to Bucharest, Romania are all going to happen this weekend, and even though the sun will rise and set on Bloomsday, it would appear that Ulysses itself is in a perpetual dawn of world-wide admiration.